We picked up our car, a small black Kia, at Luton airport and nervously set forth. 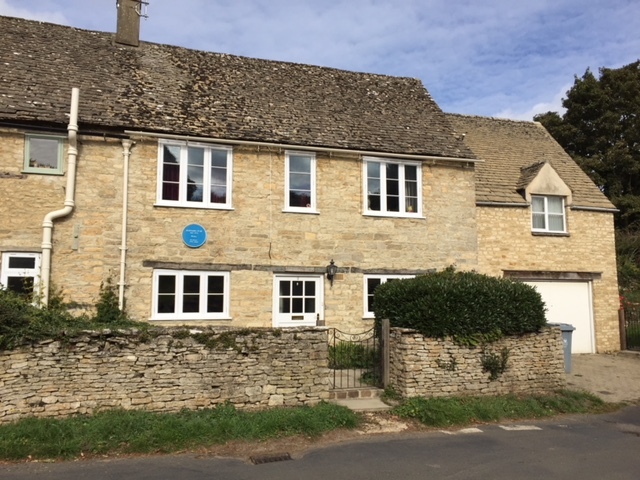 Our first destination was Finstock, Oxfordshire, where the novelist Barbara Pym spent the last eight years of her life. In fact, we were bungling the art of English driving, a nerve-wracking venture, especially right-hand turns, and especially for the mildly dyslexic (Michelle); luckily, Jim is doing the driving. Once off the main road, we got plenty of practice on the roundabouts, with coaching from the car’s GPS, who relentlessly instructed us, often twice in the space of a mile: In a quarter mile leave the roundabout at the second exit. A friendly server in a tea shop sympathized with our driving anxiety and assured us that caution and concentration would see us through. The day was sunny, with clouds taking on many formations overhead. 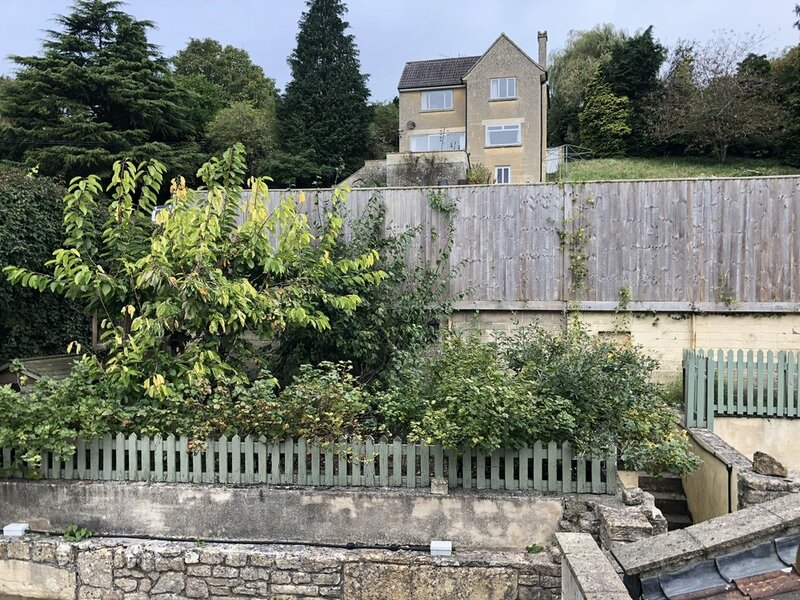 The countryside—or what we could glimpse of it through gaps in the hedgerows—was scenic, and somehow familiar, as if after all the English novels, movies, BBC productions, and landscape paintings we’d absorbed over the years, we’d actually inhabited it. Which in a sense, we had. And in the way life has of imitating art, we began to feel as if we were now in a British novel. Finstock is a very quiet, very little town. We stopped at the Plough Inn, Barbara Pym’s local pub, hoping for lunch, and although we walked right inside, it was in fact closed on Mondays. 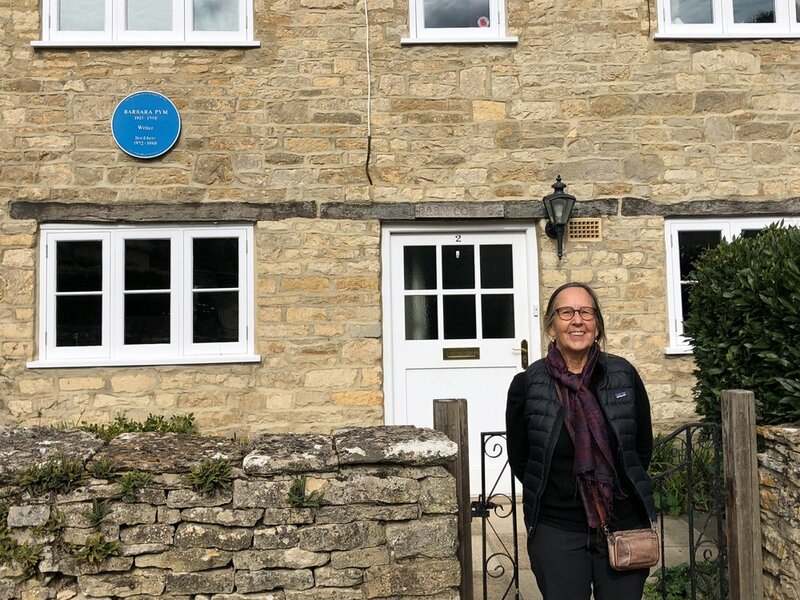 The owner, however, cheerfully directed us to Pym’s cottage, just two doors up on High Street (we could see the round blue plaque through the window). 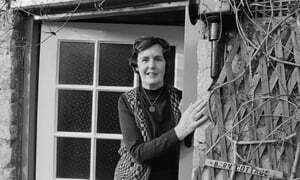 As many of you know, Barbara Pym was a mid-century British writer who produced eleven short, quiet, and deeply amusing novels in which spinsters pined for curates and archdeacons, church bazaars generated drama, and archaeologists suffered for love in post-War England. Pym’s first six books, beginning with Some Tame Gazellein 1950, were published in rapid succession, but in 1961, her seventh submitted manuscript was rejected by over 20 publishers for being out of step with the times. For the next 16 years, she kept writing, although not at the same clip, and in an ever-darkening vein. Finally, two respected literary figures (Philip Larkin and historian Lord David Cecil) named her in the London Times Literary Supplementas the most underrated writer of the 20thCentury. She enjoyed two years of fame—all her books came back into print (in England and America) and a new one, Quartet in Autumn, was nominated for a Booker Prize. She died, aged 66, of breast cancer in 1980. My personal favorites among her books areSome Tame Gazelle, Excellent Women, and A Glass of Blessings. But that could change. We walked over to her attached cottage (named Barn Cottage), where she had lived in her retirement with her sister Hilary; I had seen photos of Pym there, and a short film of her serving tea in the adjacent garden. In real life, everything looked smaller and closer, although the roses and cosmos bloomed mightily in the garden. Barbara Pym is constantly being “rediscovered;” every few years, there is a brief article about her in the New York Times Book Review or the New Yorker, and there are American and British Barbara Pym societies, but her wry, understated, comic style, while often compared to Austen’s, has never captured a large share of literary attention. From Barn Cottage, we walked up to the church, which was not so easy to find: after some wandering, we had to ask directions at the tiny grocery store. (The Finstock locals were incredibly helpful, even if some had never heard of Barbara Pym). 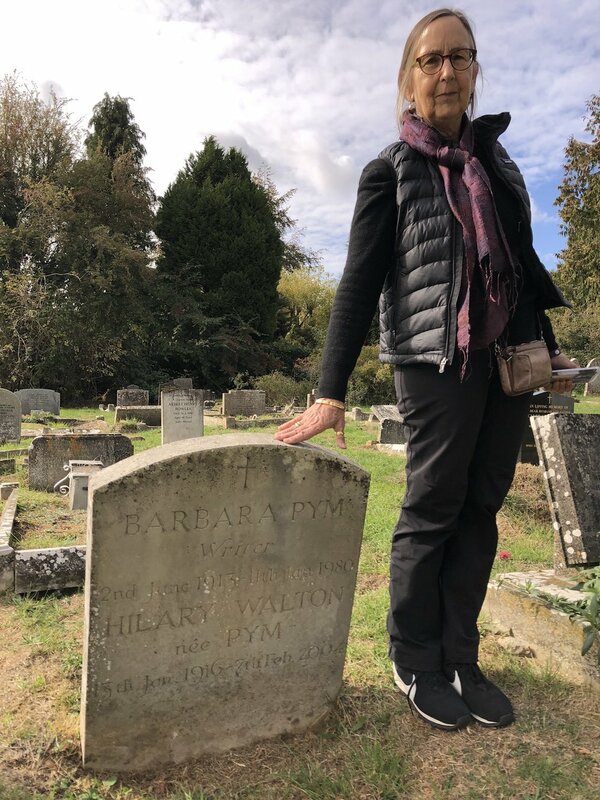 Without difficulty, we found Barbara and Hilary’s shared stone in the graveyard. At its foot, a small bucket of faded plastic flowers rested on its side. 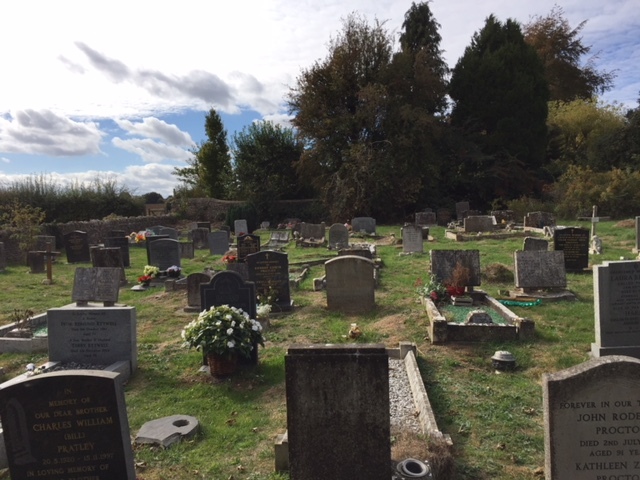 The grave itself had a bright wide-open, peaceful aspect with a view of rolling hills and lots of sky. The small church was open, so we wandered in. Needlepointed cushions were scattered in the pews—those benches get hard when the sermon goes long! 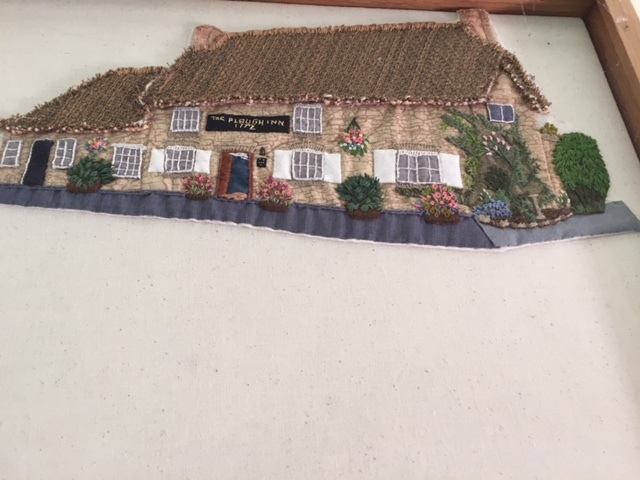 In a loft upstairs hung several embroidered tapestries showcasing Finstock’s features: the birds, the handicrafts, the businesses and various homes were represented in stitchery; the Plough Inn warranted a rendering; Barbara Pym’s Barn Cottage did not. Quiet in life, quiet in death. On we pressed toward Bath, when we came to some alluring ruins by the side of the road. 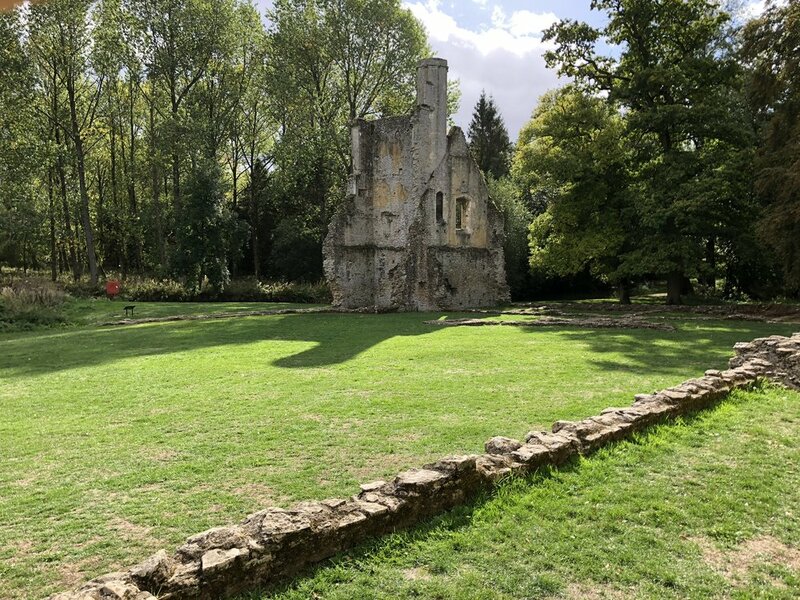 We parked and walked in to see the stone remains of Minster Lovell Hall on the Windrush River. Built in 1440 and last inhabited in 1747, the stone hall has mostly crumbled, but some parts picturesquely persist. The nearby dovecote, a perfectly round blonde stone structure in which over a thousand doves could be raised at a time, is still intact although not in use. With the slanting afternoon light of early autumn, with the tea-brown Windrush moving slowly past, and the breezes rattling the high leaves, the remains of Mr. Lovell’s ancient home proved a potent enchantment. More roundabouts, more hair-raising right turns, until finally we reached our B & B in Batheastern, just outside of Bath. Poplar House is a 17thCentury stone house nicely—even sumptuously--updated while still retaining its character. We have a pretty sage green room with a window seat overlooking a courtyard and a chicken coop (all rescued hens, no crowing rooster, but then such thick stone walls create a marvelous quiet). We also have rights to a large sitting room right across the hall that overlooks a vast meadow through which flows the River Avon. Books—novels, histories, biographies, travel and cookbooks--are piled on every surface—what’s not to like?